The first thing to say is that this is lobster à l’Amoricaine, and not à l’Americaine. Now I have to admit I don’t know what a à l’Americaine is. It may exist in its own right, although the recipes I’ve seen out there under that name look pretty identical to the ones for à l’Amoricaine. It may however simply be an understandable corruption of the real name of the dish by people who had heard of America, but not Armorique, of whom I’m guessing there are a heck of a lot. Armorique is the Northern coastal region of Brittany, also known as the Cotes d’Armor. “Armor” is the Breton for at (or on) the sea(side). So basically Cotes d’Armor means the Coast Coast, which sounds silly, but that’s language for you. So anyway, it is a dish from the North-West of France, home of my Mother’s family, and the same sauce is often used for monkfish, giving lotte à l’Amoricaine which is excellent, and a bit cheaper (but not much these days). There are a number of variations of the sauce, from the very simple 5 ingredient that is a staple in our house to go with white fish, via a refined and more intense version perfect for birthdays, to an almost bisque-like version that personally I’m not keen on. I can’t find any reference to such a bisque-sauce in my older Breton cookery books, and I can’t help but wonder if it didn’t evolve as a fancy cheat in restaurants. 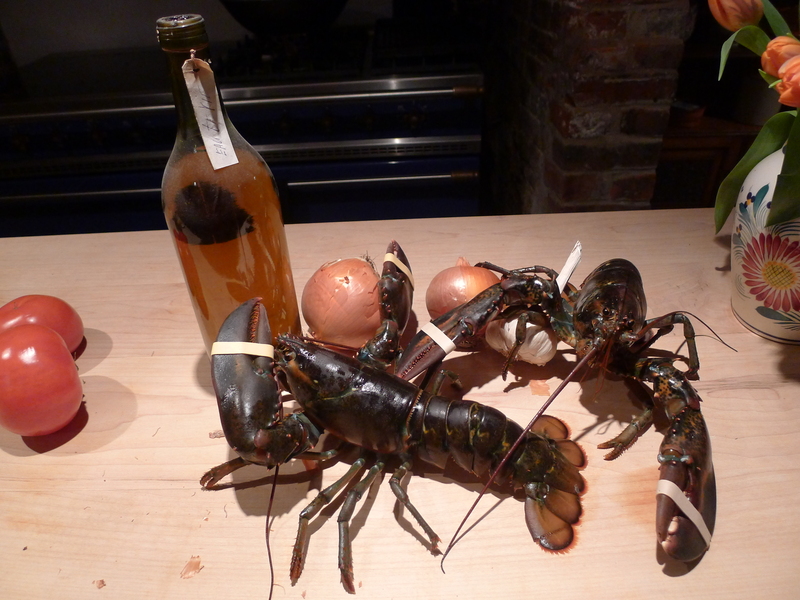 It’s faster and potentially cheaper, depending on the quality, to tip a can of bisque over your lobster than to make a good sauce from scratch. It is a glorious dish, although perhaps not my absolute favourite thing to do to a lobster, that honour is reserved for Homard grille à la Camaretoise, which is a grilled affair, but with crème fraiche for luxury. But it is not my birthday, so homard à l’Amoricaine it is. Click here for the recipe. To be honest both dishes are beautiful, and both filled with memories of family celebrations at my grand-parents home in France. Basically you have two choices. The easiest option, backed by animal welfare organisations, is to put the lobster in the freezer for anywhere between 45 minutes and 2 hours to “go to sleep”, and then plunge it quickly head first into rapidly boiling water. Check it to make sure that there is no longer movement before you get it out of the freezer, but don’t let it freeze completely. Option 2, which is also humane but can be tricky to pull off, is to carry out the freezing process as per option 1 and then cleave the head in two lengthwise with one blow. I favour option 1, but then I’m not handy with a cleaver. The skewer in the back of the head business is not really the way to go; it probably just paralyzes the lobster, but does not knock it out, so to speak.